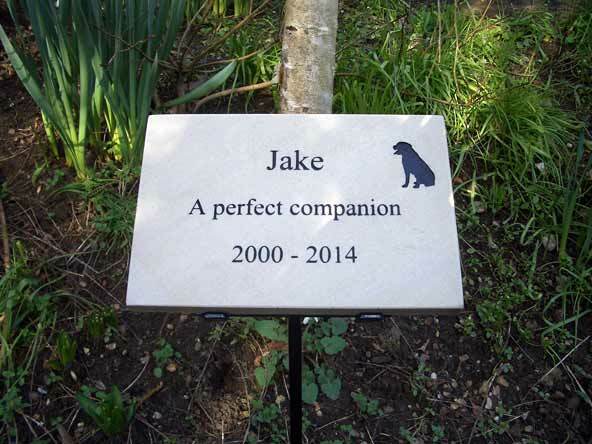 Our pet memorials are absolutely perfect as plaques for mounting onto walls or by simply placing them onto the ground on a flowerbed, grass or even some stone gravel within your garden or remembrance area. 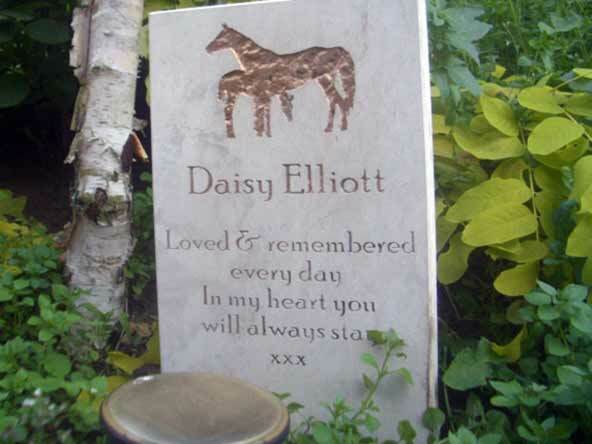 Our Stone Memorials are great for all Horses, Dogs, Cats, Rabbits, Small Animals and Exotic Pets. 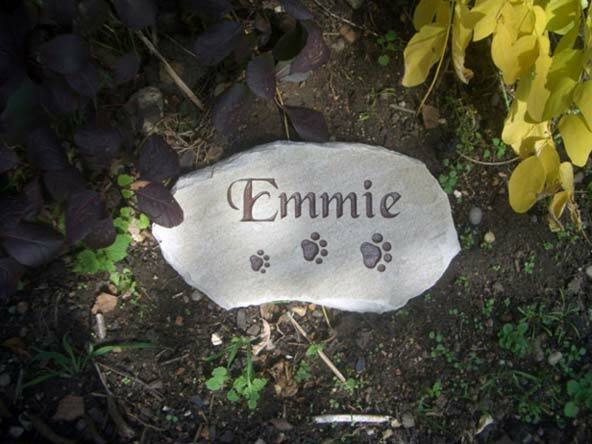 Our remembrance stones for pets are available in various materials such as slate, marble and sandstone. 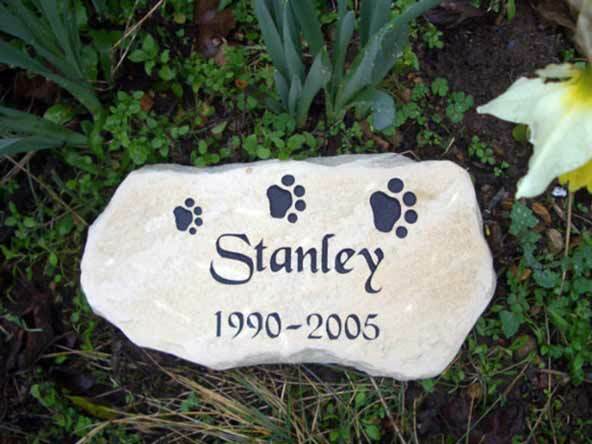 We have provided memorials for pets in many different types of stones over the years but Rustic Stone has found that marble, slate and sandstone are the best for all memorials. The stones we sell are all handpicked from local quarries here in the UK, we always check for decent thickness and free from undesirables such as deep cracks and chips. 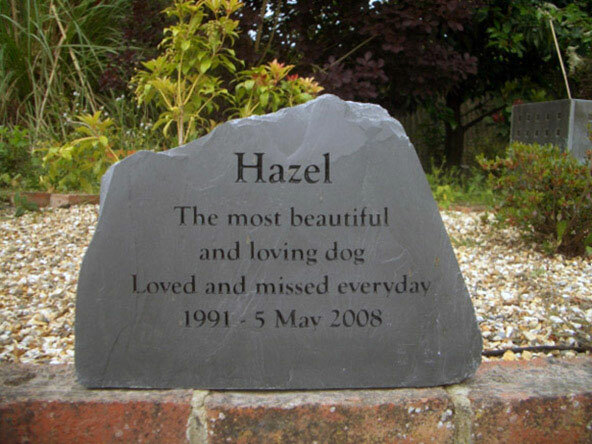 All our pet and animal markers are fully customizable, should you want a unique engraving style using many of our preloaded stylish fonts, or maybe you want to use an image on your pet memorial, our online tool will allow you to put your ideas into a working product. 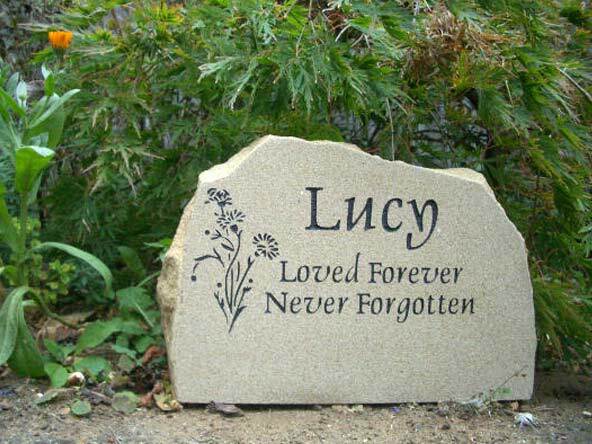 We offer sandstone plaques that are great for high and low contrast gardens, it works extremely well with darker flowery flowerbeds, gravel beds, grass or even leading it up on a tree. Because this is a lighter stone dark text works really well and makes it incredible easy to read no matter how sunny the day may be. We use several types of slate sourced from all over the UK, slate is an extremely tough stone and requires little maintenance. Because the stone generally a darker stone compared to sandstone and marble white engraved text or a lighter colour works best. 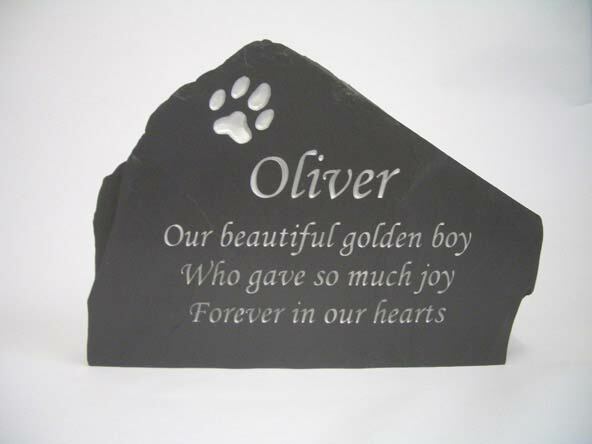 We only use the best hand-picked stones for all our pet memorial products. 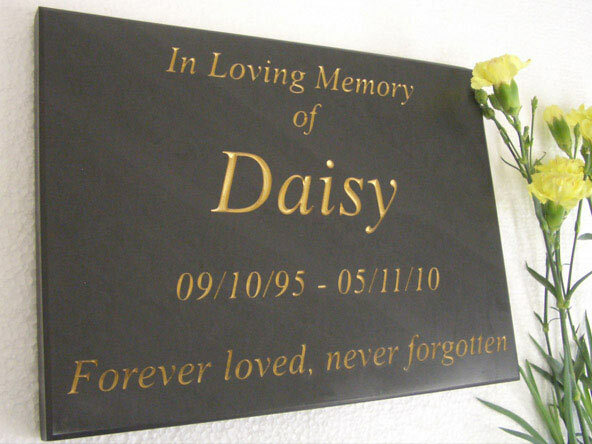 Our marble plaques are great and generally better if you want a smooth and reflect-able stone, we offer this type of material in various sizes but please note we do not always have it in stock so please check with us before placing an order if you are in urgent need of this remembrance. 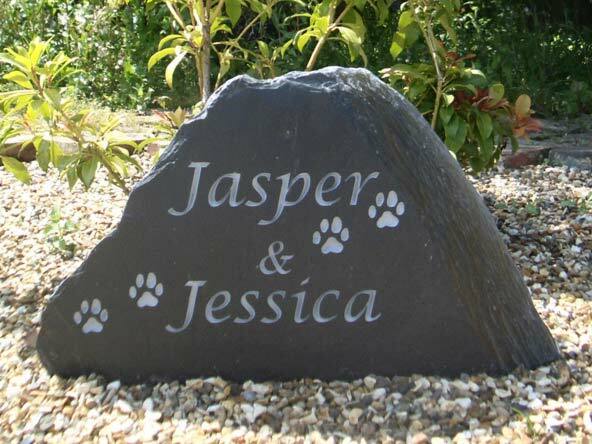 We are now pleased to be offering our customers Yorkshire or generally known as York Stone on our large Pet Memorial range. 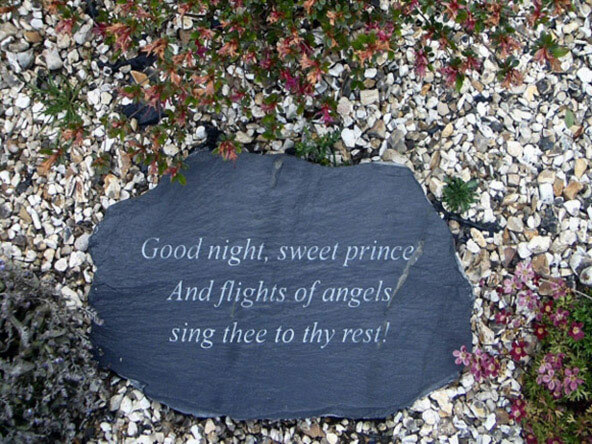 Available as a headstone our stones are made to last and our York memorials are heavy and will have no problems standing through Britain’s worst storms. 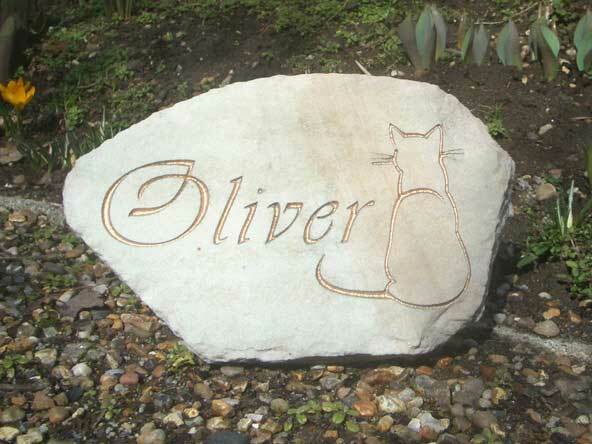 Have used Rustic Stone twice now for pet memorials. Great product and customer service both times. Would definitely use again. The design and ordering was so easy, the follow up swift and the item was made and dispatched in a couple of weeks. The item arrived well packaged and was of excellent quality. I can’t praise these people enough and would not hesitate ordering again. The memorial stone is beautifully made and is a fitting tribute to a much loved pet. Thank you for your help and we are pleased with the craftsmanship. Beautiful piece, expertly made. My sincerest thanks. The service I received throughout my order was second to none and the delivered finished plaque exceeded our expectations. I received delivery of Storm's memorial stone today, thank you so much for doing it so quickly at such short notice, very much appreciated. It is beautiful and we are very pleased with it. 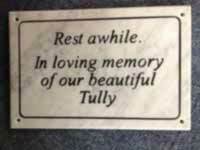 I received my pet memorial stone this afternoon, it was exactly what I envisioned it would be. 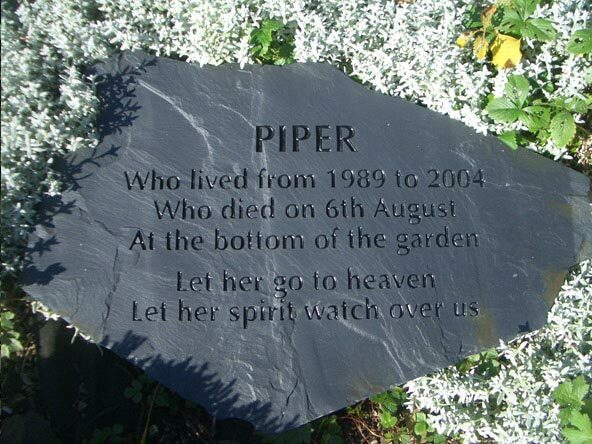 Thank you so much for the garden memorial that you designed and made for us. 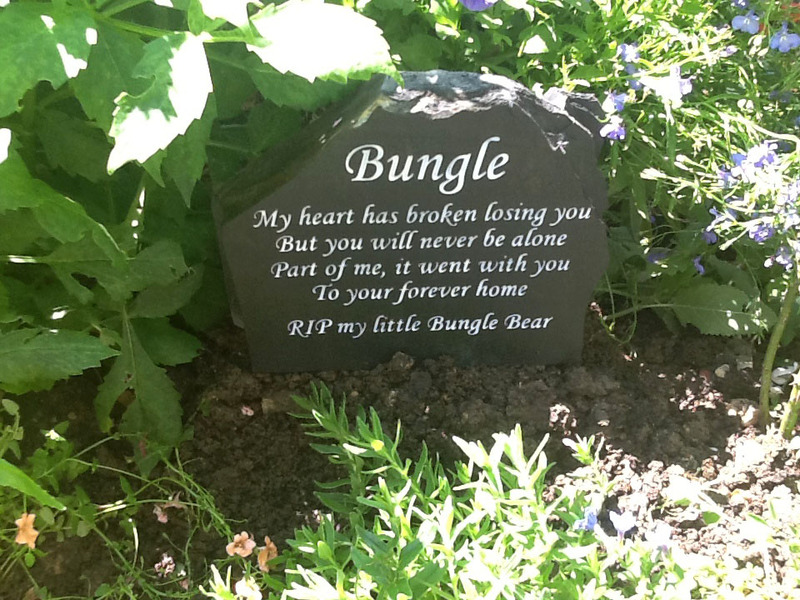 It has taken pride of place in our garden and the whole family now has closure on the death of their beloved pet. 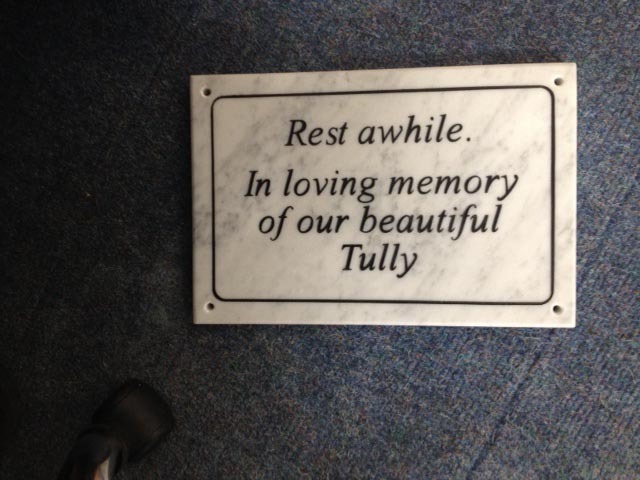 I cannot recommend this company strongly enough to anyone wanting a memorial plaque! Their patience is astounding and the quality of the finished product went far beyond my hopes. A fitting stone for an amazing pet. The finished quality is excellent and it was very well wrapped for its transit. My poor sheep are struggling at the moment after 2 very heavy falls of snow here this week. I also took 3 additional sheep from the RSPCA at the weekend, that had been abandoned over Christmas, but are now enjoying lots of TLC with me here! It arrived safely and it is just lovely. All the family are delighted. Thank you for your patience when designing the mockup. 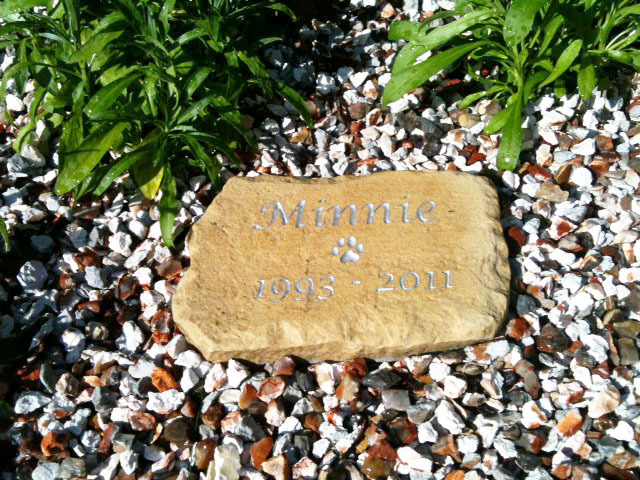 Very pleased indeed with our pet memorial stone which arrived safely yesterday. We are trying it out in different places to see where it looks best in the garden. The memorial stone for my Poppy has arrived today and I like it very much. As promised here is a photo of the stone in place. I just wanted to let you know that I have today received my memorial plaque. I love the memorial, it's perfect for my little boy! Received the stone. Absolutely superb. It's a wonderful stone, beautifully made. Maxi stone arrived today, thanks… it is what I wanted and I like the light coloured writing. It is already placed amongst the flowers where he hopefully rests in peace. 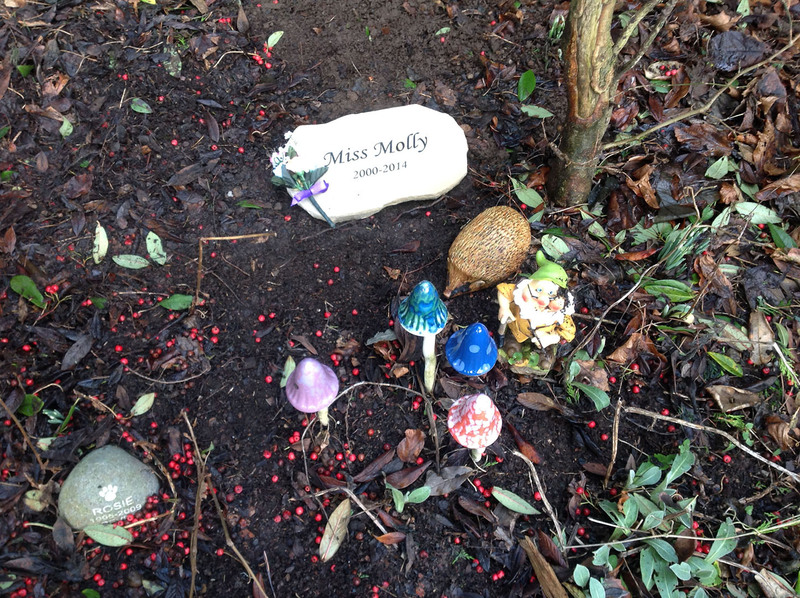 Thank you for the pet memorial stone and for posting it abroad! It is just perfect… very tasteful. The font preview tool was very useful. It arrived this morning and I put it in the garden straight away, in a quiet little corner that gets lots of sunlight, where Lucy loved to sit. 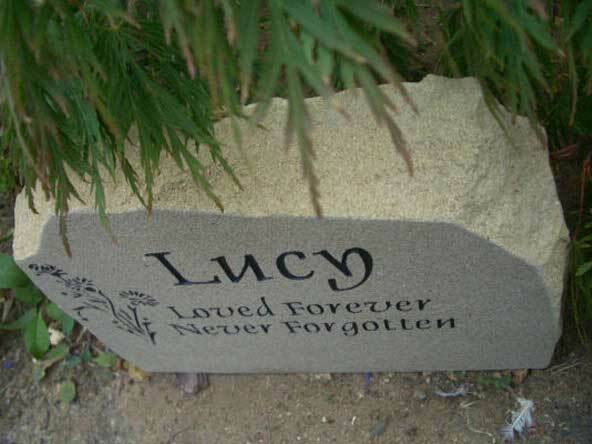 A beautiful way to remember my little Lucy! My son and I like it, its got pride of place in the garden, many thanks once again. I received Pepsie's Headstone on 10th May 2011, sorry for the delay, I would like to thank you for a perfect memorial. I am very pleased with the quality and service and will e-mail you a photo when I get it in place. Beautiful job, we are really happy. Many thanks for a lovely job and we would have no hesitation in recommending Rustic Stone to others. Stone arrived this morning, it is lovely. 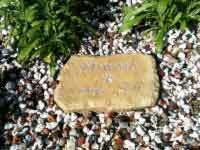 Thanks so much for the stone it was just what we wanted and we are very pleased with it. Not to over the top, I did not want to establish a shrine to them but just a little bit of the garden set aside to mark their burial. Just to let you know that I have received Polo's stone this afternoon and I am absolutely delighted with it. I just want to thank you – it looks beautiful & skillfully made. I'm very pleased with it & it will look great in the garden. Just wanted to say thank you very much for Cassies slate. It looks great and has now blended in really well with the slate you did for Meg.